Students at Portland Community College are automatically awarded degrees and certificates upon completion of requirements for the student's recorded program of study. Opting out of an institutional award requires emailing the Student Records and Graduation Office. Multiple credentials may be automatically awarded within a student's program of study. To declare a new program of study, click Update your degree and major in the Term-to-Term Checklist on the MyPCC Home tab. Call Enrollment Services at 971-722-8888 (option 2) if you are unable to use the online form or want to add additional degree/majors or certificates. In GRAD Plan, you can discover which classes you still need to take in order to graduate! Frequently review your GRAD Plan on the My Courses tab in MyPCC. If your GRAD Plan does not reflect the academic catalog requirements you are following, please contact Student Records at 971-722-7100. Learn more about GRAD Plan. 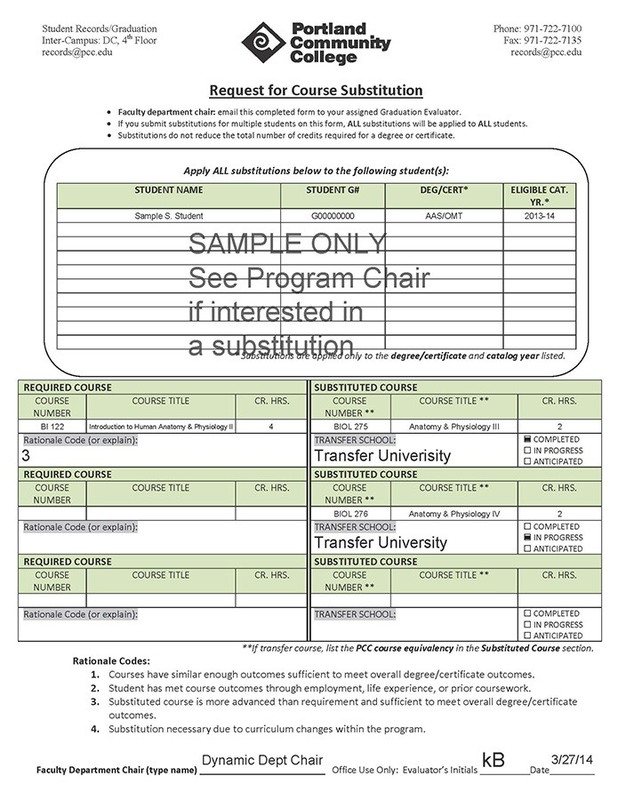 If you are completing alternate requirements, please work with your Faculty Department Chair to submit a Course Substitution Form (view a sample substitution form here; actual forms available from your Department or Faculty Department Chair). If you have attended a previous college or university, follow the online transfer credit request process. If you are not registered for this academic term, but you believe this transferred coursework will complete your degree or certificate, please submit an Application for Graduation [pdf], so we can evaluate your records for graduation. During your final quarter of your program of study, the Student Records office will review your academic history to confirm all requirements will be met for your degree or certificate. You will receive an email via MyPCC confirming your final courses are in progress. This email will include information about submitting your diploma name and diploma address. If you are in your final term and do not receive an email by Week 9, contact your department or Student Records. If you would like additional degrees or certificates, outside of your declared program of study, you should submit the Application for Graduation [pdf] before the term you will complete those requirements. Students completing their final requirements in Summer term, and who wish to participate in the Commencement Ceremony, should RSVP for the Commencement Ceremony by the RSVP deadline. Student Records will review, determine, and contact you regarding your eligibility to participate in the ceremony. When all requirements have been met, your degree or certificate will be automatically awarded. Awarding takes place in the weeks following the term's end and, once posted, transcripts reflecting the award date may be ordered via MyPCC. Diplomas are only printed for students who have ordered a diploma via MyPCC prior to their degree being awarded. You may order your diploma by going to MyPCC, selecting "Order My Diploma" and verifying their name and address. Ordered diplomas are printed and mailed 6 to 8 weeks after the term has ended. If your degree has been awarded and you did not order a diploma you can email records@pcc.edu for information about receiving one. A formal commencement ceremony is held at the end of spring term. All students graduating in the current academic year (fall, winter, spring and summer) are eligible to participate if they have RSVP’d by the deadline. Information regarding cap and gown purchases is emailed to eligible students and is also available at www.pcc.edu/commencement.